From the loading bay, to the warehouse and into the hazardous environments of a manufacturing facility, you’re going to find employees doing their job and, ultimately, completing the tasks necessary to remain efficient. With consumer demands on the rise, the pressure on manufacturers is increasing, leaving little time for downtime and more need for workforce productivity. Safety – Without proper communication, incidents may occur with something as little as a misunderstood instruction. Not only do two way radios provide clear audio in noisy environments, but the radios we will look at below include features with Bluetooth, cordless options and emergency measures. Efficiency – MotoTRBO two way radios include apps for processing work orders, giving users quick access to the data they need. Productivity – With constant pressure from customers, manufacturers are working hard to do more in less time. Having two way radios as communication tools allows your employee to work at their best, and find solutions quickly to problems that may occur. Factory floors, and other manufacturing environments are known for being loud, and chaotic. Motorola two way radios built with manufacturing in mind are made with the same features as the radio produced for first responders, including noise canceling technology and Intelligent Audio features. DTR650 (Light Manufacturing) – With enhanced options for communications, such as Digital One-to-Many (public group calls or private group calls), this two way radio will work for those busy manufacturing facilities. With potential building penetration in large work areas, including large factories, with up to 350,000 square feet or 30 floors, other features include long with enhanced battery life and audio quality. This radio is at the forefront of manufacturing ready devices. 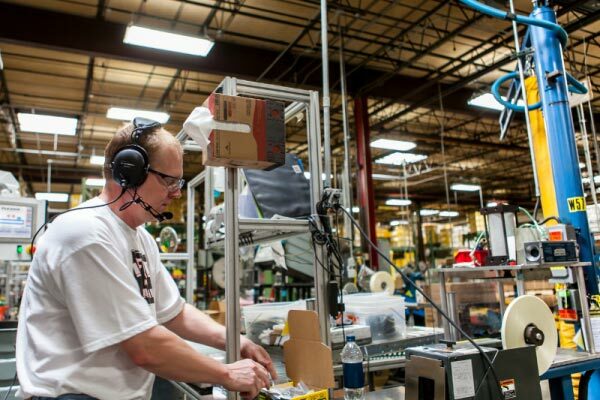 XPR3300 – An affordable two way radio tool for the busy manufacturing professional. This radio can transition to digital with a simple upgrade when your business is ready, and is equipped for noisy, challenging environments. Known for being both compact and lightweight, making it comfortable to wear throughout the workday. A safety benefit to this radio is the ‘transmit interrupt’ feature, which enables a user to interrupt a conversation to deliver critical communication when it’s needed. SL300 – This small and compact two way radio will transition nicely from an existing digital or analog system. With push-to-talk communication, this slim and rugged radio is great for light and medium manufacturing. An added safety feature on this two way radio is the ‘transmit interrupt’, which prioritizes critical information. Display feature is shatterproof and shuts off when not in use to conserve battery power. XPR7350 or XPR7550(with optional IS feature) – An ideal manufacturing radio, built for durability, this two way radio has fantastic audio quality, full colour displays, Bluetooth for both audio and data, along with special features like waterproofing. Features include three programmable buttons, emergency buttons and an UL intrinsically safe option for added safety protection. Whether it’s manufacturing cars, clothing or other equipment, the customers of today demand results. 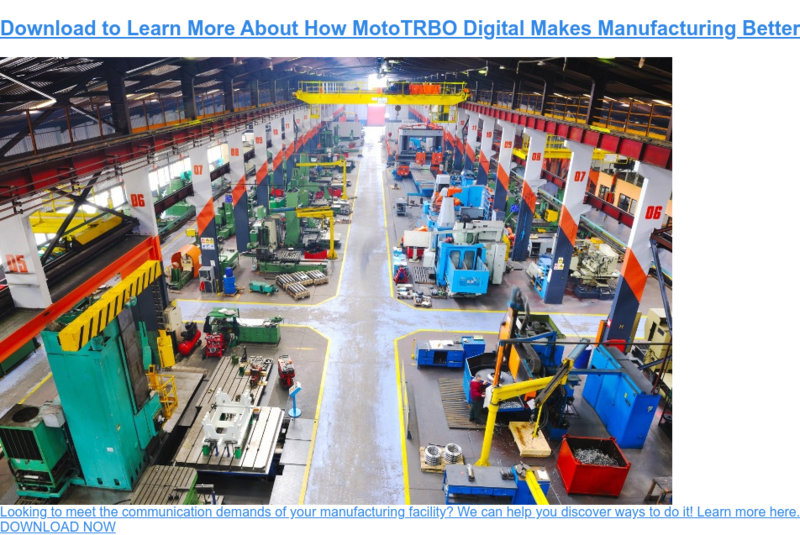 In turn, manufacturers require a communications tool that will enable increased productivity, reduced downtime and, ultimately, above all else, worker safety. Employees should be able to connect across vast areas and coverage and clarity work to increase safety. Nova Communications understands the need for manufacturers to communicate effectively with their team – and the benefits of doing so. The radios mentioned above may not be for you, but we’ll certainly have a product that suits your needs. Why not give us a call to learn more? Contact us to speak about what you want to get from your two way radio system, and we’ll find the best device for you.